1 takes two dribbles towards a basket, 2 cuts towards the same basket for a pass and layup, will rebound his own shot and switch lines. 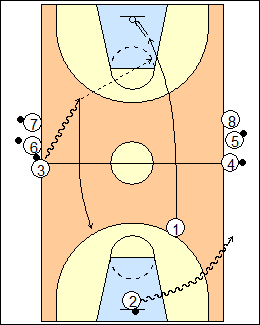 1 cuts towards the other basket, 3 takes two dribbles and passes to 1 for a layup, then 3 cuts the other way, and will get a pass from 4 off the dribble. Progression - add a coach at each basket, players drive for a layup if coach gives them a path to the basket, take a pull-up shot if coach steps into their path (or optionally make a change-of-direction move if coach steps up tight on the side of the drive). 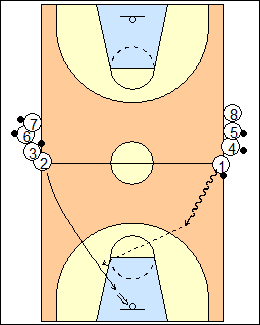 See Shooting - Pasquali reaction, Dribbling - Chair drill.